Can Strategic Nuclear Competition and Cooperation Coexist? A Sino-Indo civil nuclear deal would have to clear substantial domestic and regional hurdles. The agreement between the two leaders to initiate civil nuclear energy bilateral talks is significant, given the competitive nuclear dynamic that exists between China and India. Notwithstanding the significance of this initiative for commercial and energy security objectives as mentioned in the above statements, a host of technical and, more importantly, strategic considerations that have not yet been fully appreciated are likely to drive or hinder such cooperation. Both China and India are advanced nuclear energy countries and are expanding their respective civil nuclear energy sectors. The two neighbors have well-established nuclear fuel cycles and reactor designs which are on par with international safety standards. However, they vary considerably on the scale and size of their respective civil nuclear energy programs. The Chinese civilian program is growing at a far faster pace with 22 reactors under operation and 27 reactors under construction, while India has 21 reactors under operation and six reactors under construction. Besides rapidly expanding its civil nuclear power generation capacity, China is aggressively pushing for nuclear reactor exports to friendly countries. Chinese nuclear giants such as China National Nuclear Corporation (CNNC) and China Guangdong Nuclear Power Holding Co., Ltd (CGNPC) are exploring new markets to export their reactor technology. India, which has ambitious plans for the expansion of its civil nuclear energy sector, naturally constitutes a lucrative market that the Chinese nuclear giants would like to access. 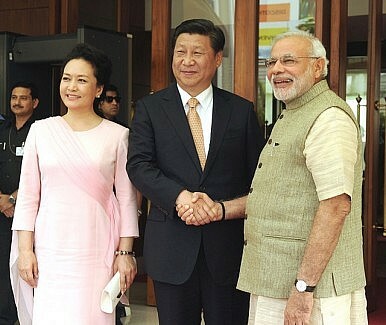 China’s willingness to engage in nuclear commerce with India underlines a noticeable shift in Beijing’s attitude. The only instance in which China officially engaged in nuclear cooperation with India was in 1995, when China supplied 30 tons of Low Enriched Uranium (LEU) for the two safeguarded Tarapur reactors. However, China was quick to terminate the LEU supply agreement after India’s Pokhran nuclear tests in May 1998. One of the possible explanations for China’s support of India’s waiver by the Nuclear Suppliers Group (NSG) in 2008 could well be its aspiration to engage in nuclear commerce with India just as other members of the NSG do. Whether or not that is the case, the fact is that India’s civil nuclear energy market offers billions of dollars in investment opportunities, and Chinese firms are keenly exploring the potential for meaningful cooperation. For Beijing, nuclear commerce with India could also be geo-strategically significant in terms of gaining the diplomatic upper hand over Japan. Despite New Delhi’s persistent diplomatic overtures, Tokyo has been reluctant to enter into a bilateral nuclear cooperation accord. While Japan has invested in large-scale infrastructure development projects in India, China’s decision to do the same while also investing in strategic sectors like nuclear and space could buy it considerable influence relative to Japan in Delhi’s strategic calculus. For Beijing, the proposed nuclear cooperation with India could be significant from an economic and strategic standpoint. Notwithstanding Beijing’s keen interest in nuclear cooperation with India, an affirmation by the Indian premier to initiate nuclear energy cooperation talks with Beijing is puzzling for several reasons. As part of its civil nuclear energy expansion strategy, India has signed several bilateral nuclear cooperation agreements in the aftermath of the “Indo-US nuclear deal” – Delhi is currently negotiating techno-commercial agreements for constructing nuclear power plants with Russia, France and the U.S. To this extent, India could positively consider any Chinese proposed sale of nuclear reactors, after certifying that the reactor designs offered by China meet the desired Indian regulatory and safety requirements. At the commercial level, India’s decision to buy Chinese nuclear reactors would be determined by factors such as cost, construction time, possibilities for technology transfer, and the participation of the Indian industry in reactor construction. The cost and terms of technology transfer could well be the key determinants influencing India’s decision to accept the Chinese reactors. China, which has earned a global reputation for low-cost manufacturing, would be expected to offer reactors at a competitive price compared to Indian reactor manufacturing costs. Apart from the aforementioned commercial considerations, it is not clear strategically how engaging in nuclear cooperation with Beijing would impinge on New Delhi’s longstanding protestations over Sino-Pakistani nuclear and missile cooperation. New Delhi has been deeply wary of Beijing’s atomic bonhomie with Islamabad. Will nuclear cooperation with Beijing compel New Delhi to drop its long-standing objections to Sino-Pakistani nuclear cooperation? Will India be able to oppose any future China’s nuclear cooperation with Pakistan, or for that matter, Beijing’s support of any possible NSG waiver for Pakistan? Although the discussions on civil nuclear cooperation are at a very preliminary stage, the BJP government in New Delhi will have to tackle such questions before making any concrete move on Beijing’s proposal. Engaging in nuclear cooperation with China may tie Indian hands in many ways that would not only affect South Asian regional dynamics, but also the larger Asian nuclear order by way of enhancing the Chinese sphere of influence in the nuclear domain. It nevertheless remains to be seen how India will manage nuclear cooperation with Beijing, and whether an attractive commercial deal for Chinese nuclear reactors would override New Delhi’s other considerations. Kapil Patil is a Research Assistant at the Indian Pugwash Society, New Delhi. The views expressed are his alone.